It always seems like a few people on my Christmas list are impossible to buy for. If you can relate, I can offer you some relief. Hendricks County is home to uPaint Pottery Studio, where you can make some beautiful, personal gifts, while also making memories with friends and family. The studio is always changing and adding events, and this holiday season is no exception. They have thought of everything. There are countless opportunities offered over the next two months to help you make the most of the season. Try as I might, holiday crafts with my kiddos can be a bit overwhelming. Especially in the midst of holiday chaos. I always seem to forget certain supplies and dread the mess, but I love the time we spend actually creating something together. It&apos;s a nice change of pace, slowing down and enjoying the simple things. The problem is the before and after are never simple. Enter uPaint Pottery Studio. Cue the choir, let the angels sing. At uPaint Pottery Studio, the hard part is done for you. There&apos;s a variety of pottery and glass pieces to choose from and the supplies are all there - ready and waiting. The studio is located at 1820 E Main St. in Plainfield. Normal business hours are 11 a.m.-8 p.m. Mondays-Thursdays, 11 a.m.-9 p.m. Fridays, 10 a.m.-8 p.m. Saturdays and noon-5 p.m. Sundays. Pottery and glass pieces range from $5-$80 and a $5 studio fee covers the cost of paint and supplies. Once you&apos;ve finished painting your pieces, the studio will fire it and have it ready for pickup in 7 days. Whether you&apos;re hoping to get a jump start on Christmas gifts or looking to spend some creative time with the kiddos, uPaint Pottery Studio has you covered. The studio has design and inspiration books and a friendly staff to help you create something special. Bring your little readers to the studio at 11 a.m., Nov. 5 to hear a festive story and paint a piece that goes along with it. They&apos;re sure to enjoy using their little hands to create a turkey print on a plate. They&apos;ll also receive a snack. No reservations are needed, but mark your calendar. Cost is $13. If you&apos;ve been looking for a new centerpiece for your Thanksgiving table, mark your calendar for Nov. 11 for their 6 p.m. Glass Class. At this event, the studio will help you create a festive turkey bowl. Cost is $35 and includes a base, glass piece and firing. Call (317) 406-3072 to reserve your spot. Whether it&apos;s your own or a loved ones, this would be a beautiful addition to whatever table you plan to gather around - and so much fun to make. The studio will host two ornament painting parties -- Nov. 16 and Dec. 15. Both begin at 6 p.m.
Bring the whole family and make it a tradition. The studio offers a variety of ornaments to choose from, so you&apos;re sure to find something perfect for your tree or to give to someone special. 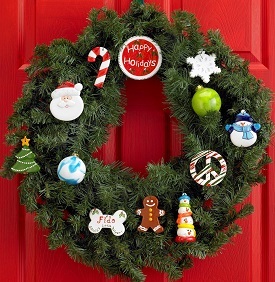 The cost is $15 and includes an ornament, supplies, firing and a snack. A fun night with the family making personal gifts? Sign me up! The studio will also host two Glass ornament parties at 6 p.m. on Nov. 10 and Dec. 1. Join them and create a unique gift or a new favorite for yourself. Cost is $15 and includes a base, glass piece, supplies, firing and a snack. Reserve your spot for a ornament party by calling (317) 406-3072. I&apos;m thinking I&apos;ll take the whole family to one party and some girlfriends to another. This event is sure to be a hit! Santa is coming to the studio at 9 a.m. on Dec. 5 and 12. 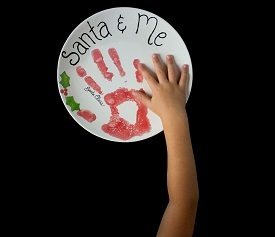 Kiddos will spend the morning painting a hand print plate with their print and Santa&apos;s. How fun? What a great way to celebrate with your little ones during the holiday season. The memories they make at this event are sure to be long lasting - and the precious keepsake plate will last even longer. The cost is $18 and includes a visit with Santa, hand print plate, donuts and juice. Limited space is available, so reserve your spot today by calling the studio. Ladies, head over to the studio from 5-9 p.m. on Nov. 6 and 20 and Dec. 11 for "Ladies Night" 1/2 price studio fees. It&apos;s a great excuse to gather your favorite girls for a craft night - without the headache of finding those pesky supplies or cleaning your kitchen. These are just a few of the upcoming special events offered at uPaint Pottery. Be sure to check their events calendar often. This is my favorite time of year. But I tend to get a bit anxious as I try to do too many festive activities. After reading this, I&apos;m sure you&apos;re thinking what I&apos;m thinking...making memories and creating unique gifts during the holidays sounds a lot less hectic with the events offered at uPaint Pottery Studio. I&apos;m thinking my family is going to start some new traditions this year. Hope you do to.